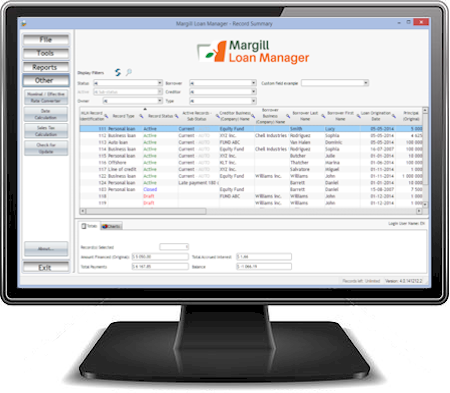 Transform hours of Loan Servicing into minutes. Post paid, unpaid, partial and late payments, add Fees, add Comments, etc. “Unpay” paid payments in batch. New 4.4 – Send automatic reminders to Borrowers by Email (upcoming payments, unpaid payments, etc.). Create your own templates. Interest Accrued and Paid, Paid Principal, Outstanding Amounts, Principal Balance, Due Interest, Payment source, etc. New 4.4 – Background tasks: automatic backups, current balance recomputation, alerts etc. This software was exactly what we needed and we have been happy with the functionality since 2009. It is updated frequently and service is great. It has brought considerable ease to our loan management. See detailed product history and Release notes since the product launch in 2007.